We provide a single point of contact and responsibility for the rapid closure of end-user technology questions and problems. This service will assist you in all your PC hardware and software support requirements and is accessible via phone, fax, email and the web. Ensure that your desktop systems run at maximum efficiency and are kept free of viruses and spyware. A crucial aspect of server management covers the administration of the resources that define the users and their data. People and data change constantly as do their relationships. Managing this dynamic is crucial to maintaining the integrity of your company’s information and the effectiveness of your staff. Ensures that your network servers run at maximum efficiency and that network problems are identified and resolved before they cause service outages. Secure, Automatic and Reliable. We will plan and setup a back up strategy that meets your businesses needs. All businesses should have at least a two-tier automated backup process. Options range from the simple and very affordable to more comprehensive and sophisticated solutions. Contact us for more information. Extract data from failed, corrupted, or physically damaged media devices such as hard drives, RAID arrays, tapes, and other computer removable media. A.P. 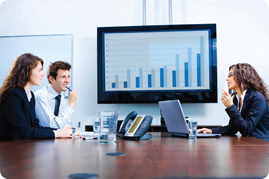 Computers has assisted many of its clients in designing and implementing fully functioning meeting and boardrooms. We are able to ensure a 21st century corporate atmosphere, by providing all you need for successful meetings, including conference calling, LCD or Plasma T.V.s, custom built computers for viewing documents or displaying videos and slide shows in addition to internet access. Ensures that your systems run at maximum efficiency and that network problems are identified and resolved before they cause service outages.